To beat the relentless heat, buzzing mosquitoes, and relentless heat, a great outdoor bar can be your oasis of frosty beverages and fresh breezes after work, on weekends... and pretty much every other waking moment of summer. Because we care, we rounded up the best of the best places in town where you can grab an ice-cold beer or a tart-but-sweet classic daiquiri from the comfort of a shady, booze-filled haven. Whisler’s is the the go-to patio on the East Side for great classic cocktails, spicy eats from Thai-Kun, and ample seating. And, it’s walking distance from a handful of other great spots if you want to keep the party going. With the brunch game on lockdown (beef tongue hash! ), a serious cocktail list, and essentially no option but to sit outside, Contigo's is a serious contender for patio champion. Do you know where to go when you’re in the mood for margaritas and chips and salsa (and queso and ceviche... )? El Alma is the answer. 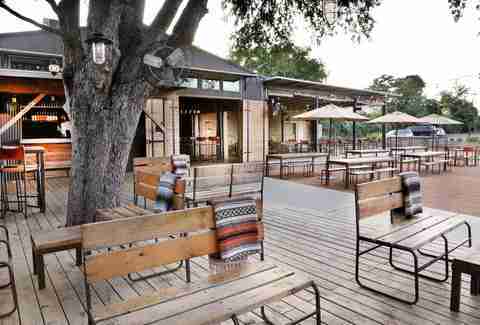 In addition to a generous happy hour, the Barton Springs restaurant has a shady rooftop with views of Austin’s skyline. 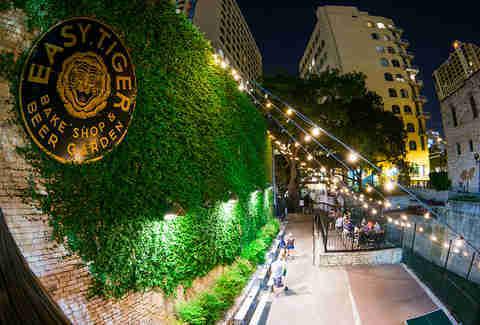 In what has surely climbed our list since Waller Creek’s recent renovations, Easy Tiger is a heavy-hitting spot for outdoor revelry, thanks to a next-level beer list, sausage-based comforts, and more ping-pong action than you can shake a paddle at. 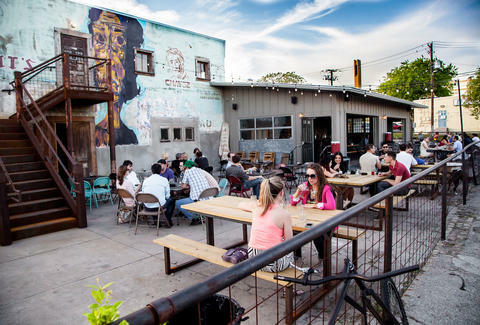 The family-friendly hangout in Southwest Austin is perfect for those of us who travel with kiddos and fur-babies. 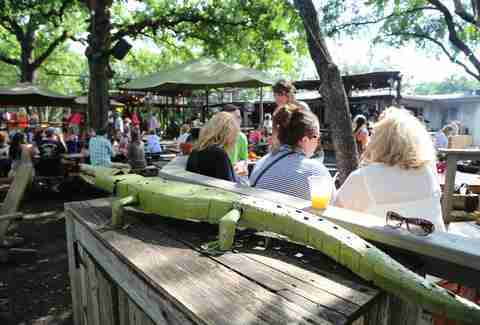 The tree-filled grounds, cheap beer, live music and food truck options make Moontower Saloon a weekend must for South Austin residents. Since relocating to Red River, Cheer Up Charlie’s has quadrupled in size -- both in space and subsequent number of patrons. The bar and music venue has patio options all around the building from picnic tables to upholstered lounge areas along with one of the best cocktails in town -- try a Golden Ticket next time you find yourself here. There are a lot of rooftop choices downtown but what sets Rattle Inn apart is the casual atmosphere (aka no bro-y businessmen) and the roof which provides much-appreciated shade in this oven of a city. Check out their happy hour (Tues-Fri, 4-7pm) where cheap drinks pair perfectly with free Skee-Ball! 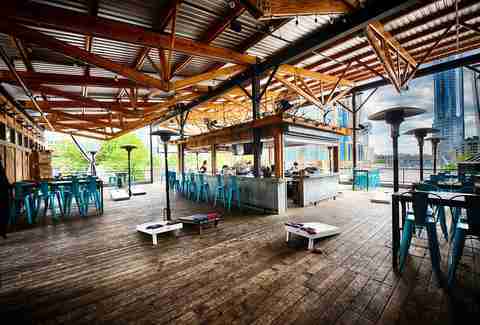 The garden patio at Weather Up is a great little refuge during Austin’s sweltering summers. We like to do brunch here with a spicy Bloody Mary and picks from their fancy brunch menu which is still somehow flying under the radar. Brunch goes down from 11am to 3:30pm, perfect for those of us who like to sleep in. Want to impress your date? 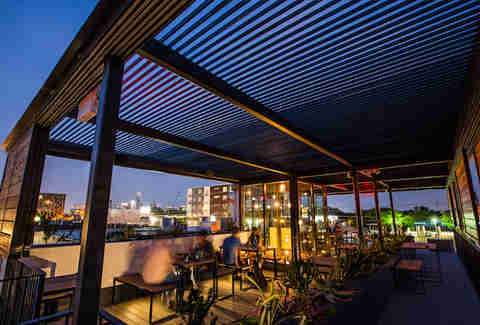 Take them to Backbeat; their inventive cocktail menu is second to none and the breezy, plant-filled rooftop is a perfect backdrop for getting to know each other. And, you can take it up a notch with a dozen fresh oysters on the half shell. Ooooo! Anastacia Uriegas is an Austin-based writer whose typical summer, alternatively, involve staying indoors, in the AC, until it gets dark. For post-sunset shenanigans and other vampiric tendencies follow: @anaurie.